Chats (or texting) - the thing you might be doing just a few seconds ago. At work or at home, on WhatsApp or on skype, we are doing this all through the day. Texting has evolved over the last few years from SMS to real-time chat applications. We all are just a text away. “Beep, beep!”. Ahh, I got a new message! Let’s come straight to the point. How we convey emotions through texts. It’s something we all humans are bound to - emotions. Which makes us human. Fear, anger, joy, sadness, surprise, trust etc. We convey our emotions to each other when we talk. But, when it comes to texting/chatting, how? It’s always been difficult to write our emotions and convey it in the same way to the other person in the written format. Considering texting as the short form of the emails, it has the same problem. You can consider this as one of the digital communication flaws. Emotions are exchanged between the two parties in a conversation. What the person is actually speaking and how the other person takes it. None of the emotions are exchanged when it is passed on in the form of texting. The person receiving the message cannot see the body language of the sender and sender cannot see the receiver, that if he/she is getting it in the right manner or not. This is a big gap here. It just breaks the basic link of the face-to-face communication. It’s often said that ~90% of the communication part is non-verbal. A large portion of the conversation is conveyed through body language. And it is completely missing in the texting world. Exchanging feelings through texting can be misinterpreted. What you want to convey and what the other person gets it. There can be differences in that. And the bad side is, you can generate that difference. By conveying the wrong message, but getting it in the opposite way. Because the person cannot see you at that time, it has to accept what you are saying in the text. Another thing is how we use punctuations, capital letters, and length of the response. Before saying out things, I’ll start it with the few examples. Ahh, got my point, right? This little thing makes a lot of difference in the conversation. Adding that multiple question marks make you eager about the question and hints the other person to respond quickly. The length of okay/ok/k shows the interest of the other person in the conversation. 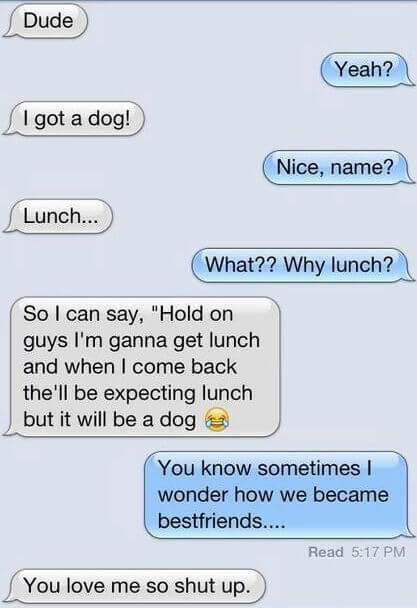 That little dot at the end can hint at the end of the conversation. The fully capital letter sentence can hint as if the other person is yelling at you. The overuse of exclamation mark, the trailing dots ….. and more tries to fill the emotions in that emotion-less text message. The length of the response also plays the role. The replies like “Ok” or “Noted” to a long 10-50 line message can lead to frustration for the original message sender. It also increases chances and doubts about if the messages are actually getting noted or not. It can also hint to end the conversation. Multiple meanings also lead to the confusion. It can change the mood for the other person. Let’s take another example. “gn” vs “Good night…” Here using acronym can change the mood for the whole conversation. Writing it full vs acronym can affect how the other person was getting the conversation. This little things can try to add some feelings to the conversation but can sometimes lead to misinterpretation and ruins it at the end. Response time also plays the role here. You can choose to ignore and replay at your convenience. Or it can hint, you are no longer interested to have a conversation. It can also hint as if you want to have the conversation, but you are busy. Different types of interpretation can confuse the person and changes the mood of the person. It can also affect the conversations going forward with the same person. Now let’s talk about emojis. The thing that you would be using to add some expressions to your texts. To make the other person understand what you are feeling right now or what are your expressions. Adding that smiley at the end of the text can add some taste to the conversation. It makes the other person believe what you are feeling right now and what are your expressions. But does this really work? Over the long period of time, I have noticed that, even though I am sending lots and lots of emojis to make a conversation as real as possible, I miserably fail at it. 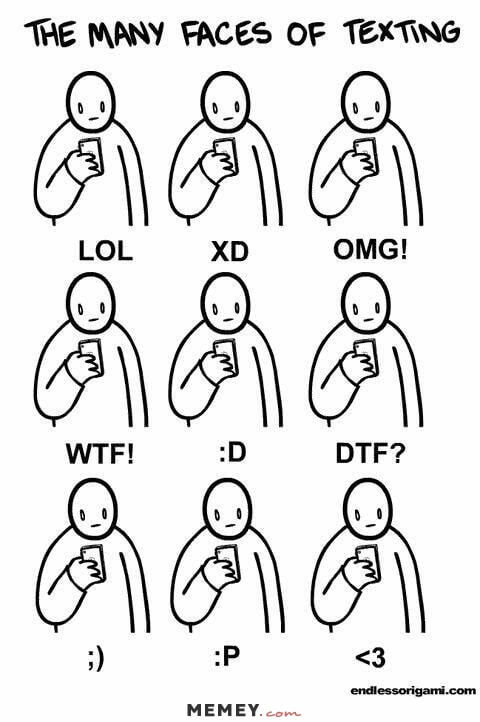 I am not actually having any expressions while sending “lol” or “rofl” messages! What does that mean, actually? Are we faking it out? Maybe! That’s how it is. You are sending feelings and expressions but is it there actually? You can easily fool another person by those smileys. You can fake out the conversation easily. Even if you are in a bad mood, you can easily fake out, that you are ok. The opposite thing can also happen. “Similes” adds the essence of feelings and emotions, but it turns out fake most of the time. Something we should work on. With those things, keeping in mind, it turns out that nothing can replace the physical presence of the person. You might have noticed it your self or heard about it, that you can chat with the person for hours, but when you actually meet face-to-face you have nothing to talk to. There are multiple factors that come into play for that. When you are just texting, you have the time to think, hold, analyze and then send whatever you want. But when you are meeting face-to-face, it just has to be prompt. The topics can come along while texting because you get time, but when meeting face-to-face, lots of factors come in to play along with body language. While texting, you can easily manage and hide your bad/off mood. But, when face-to-face it just comes in to play. While texting, your appearance does not matter. While communicating face-to-face, it matters. The presence of mind, expressions, body language comes into play when talking face-to-face. It’s not that chats/texting is bad. It has its own goods. It’s good for planning a hangout or trip. But also note its consequences. The physical presence of the person can help you develop relations with your loved one/friends that can never beat the chat conversation. It connects both of you more deeply, that results in more happiness and long lasting pure relations. Chat conversations can never beat it.